A parliamentary report of 1777 recorded parish workhouses in operation at Bedminster (for up to 60 inmates) and Winford (14 inmates). Three cottages, now known as Trinity Cottage, on Old Church Road in Clevedon were once used a parish poorhouse. Somerset: Abbot's Leigh, Backwell (2), Barrow Gurney, Bedminster (6), Brockley, Chelvey, Clapton, Easton in Gordano or St George's (2), Clevedon (2), Dundry, Flax Bourton, Kenn, Kingston Seymour, Long Ashton (2), Nailsea (2), Portbury, Portishead, Tickenham, Walton in Gordano, Weston in Gordano, Winford, Wraxall, Yatton (2). Later Additions: Bishopsworth (from 1890s), North Weston (from 1894). The population falling within the union at the 1831 census had been 29,399 - ranging from Chelvey (population 70) to Bedminster itself (13,130). The average annual poor-rate expenditure for the period 1833-35 had been £9,752. The new Board of Guardians had their first meeting on the 12th April, 1836, at the Red Cow Inn, Bedminster, not far from the old parish poorhouse. 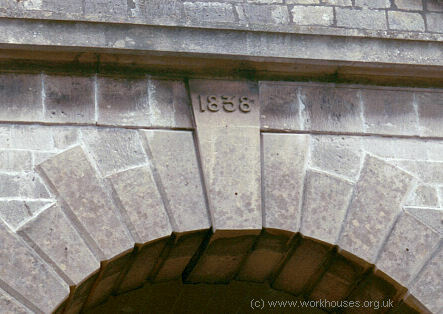 Bedminster Union workhouse was built in 1837-8 on what is now Old Weston Road at Flax Bourton. The Poor Law Commissioners authorized £6,600 on its construction which was to accommodate 300 inmates. 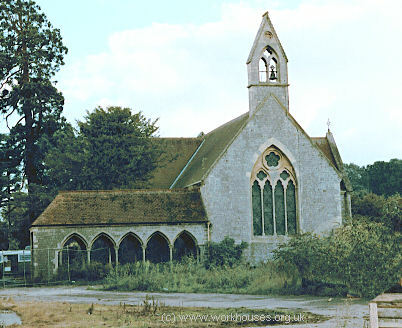 The architects were George Gilbert Scott and William Bonython Moffatt who designed many workhouses in the south-west including Williton, Bideford, Newton Abbot, and Tavistock. The buildings comprised three parallel blocks: a single-storeyed entrance range with a central archway, a main building with a central hub and cross-wings at each end, and a U-shaped infirmary to the rear flanked by a washhouse and workshops. 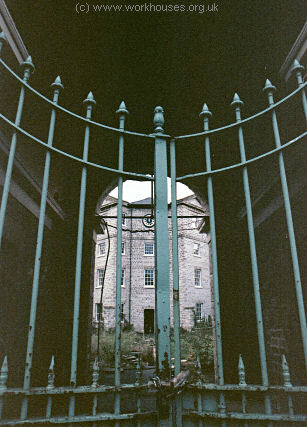 Bedminster workhouse from the south-east, 2000. Bedminster main block from north-west, 2000. Bedminster original infirmary block from north, 2000. A new infirmary block was erected at the north of the site towards the end of the nineteenth century. Bedminster new infirmary block from south, 2000. A large chapel, dating from 1860, was added at the south of the site. Designed by John Norton, it was dedicated to St George and built at the expense of William Gibbs of Tyntesfield. Bedminster chapel from north, 2000. In October 1840, the Board of Guardians asked the Poor Law Commissioners for permission to pay one shilling a week to a pauper inmate to instruct boys in shoe-making. The Commissioners refused the request, arguing that the Union was already entitled to the pauper's labour in return for taking him into the workhouse. They did however suggest that the man be taken on as an employee and would no longer be a pauper. The man was subsequently engaged at £2.12s per annum (a shilling a week) plus his maintenance and clothing. In 1855, rumours of murder and cover-up began circulating in the village of Walton-in-Gordano. The allegations concerned the suspected manslaughter of a 22-year-old female inmate of the Bedminster workhouse named Hannah Wiltshire. Hannah's death caused local public outrage and suspicion of a cover-up at her inquest. There were also accusations that guardians had concealed the true extent of neglect at the workhouse. Hannah's story and the circumstances surrounding it have been researched by Rosemary Caldicott, who has kindly allowed her article on the case to be presented here. The Bedminster Union was renamed Long Ashton in 1899. Between 1929 and 1956, the workhouse became Cambridge House, a mental deficiency colony run by Somerset County Council. It subsequently became known as Farleigh Hospital, which was the centre of a scandal in 1971 when two members of the nursing staff spoke out about the appalling treatment being meted out to the vulnerable patients. The former hospital site has now been redeveloped for use as offices although much of the original building has been preserved. The former Bedminster workhouse in 2005 following its splendid restoration. The Long Ashton Union established children's cottage homes, one for boys and one for girls, at West Hill, Portishead. In 1924, the homes could house 28 children. Staff in 1889: Master — James H Stone; Matron — Mrs Stone; Schoolmaster James Fishwick; Schoolmistress Jane Creebo; Medical Officer — James H Stone; Chaplain — Rev John leach M.A. Somerset Heritage Centre, Brunel Way, Langford Mead, Norton Fitzwarren, Taunton TA2 6SF. Many records survive including: Guardians' minute books (1837-1930); Births and deaths (1866-1930); Offences and punishment book (1871-1904); etc.